Many of you appear to be happy with the change, or are at least willing to give the Vikings’ new training camp arrangement time to play out. The Vikings’ first training camp in Eagan concluded on Thursday, at the end of a three-week program that ran a week longer than recent camps in Mankato, put the kickoff of the season in the metro area for the first time in team history — and seemed to reduce the number of opportunities fans had for up-close interactions with players. But on balance, many of you appear to be happy with the change, or are at least willing to give the Vikings’ new training camp arrangement time to play out. I decided to take a Twitter poll at the end of camp to see how fans felt about their experience in Eagan compared to the one they had in Mankato. Insofar as a one-question Twitter poll represents a scientific sampling of the fanbase, a plurality of Vikings fans said they preferred training camp in Eagan. 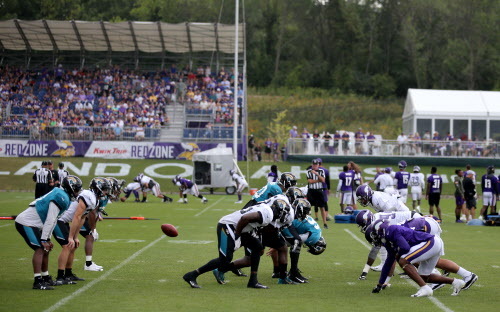 The Vikings' first training camp in Eagan is in the books, and I'm curious what you all thought of it. If you attended a day of camp in Eagan, how was your experience compared to Mankato? Feel free to expand on your vote in the comments. The Vikings say they heard largely positive reviews, too; team VP of strategic and corporate communications Jeff Anderson said the Vikings emailed daily surveys to fans who attended camp, and feedback “consistently reached scores of 8 or higher out of 10,” Anderson said. In its first training camp in Eagan, Anderson said, the team had three goals: to host training camp in a way that did not impede the football team’s ability to get ready for the season, provide a “tremendous fan experience” and minimize impact on residents and businesses neighboring the Vikings’ facility. “We can confidently say we achieved those goals,” he said. The facility won plaudits from many of you for its ease of access and the additional activities it offered beyond just watching practice; the Vikings opened up TCO Stadium each day for a variety of games, kids’ events and space to play. Fans with camp tickets were also able to attend the team’s new museum, and a number of you mentioned that as a highlight of your day at camp. Unlike Mankato, which had restaurants within walking distance to camp, the Vikings’ new facility had few food options in the immediate area. That’s likely to change in future years, but several of you said you appreciated the relative affordability of basic concessions ($3 hot dogs, $1 bottled water, etc.). Of course, there were bound to be hiccups in Year 1, and Vikings camp was certain to have a different feel on the team’s sprawling new campus than it did in a Division II college town. Many of you mentioned fewer opportunities to interact with players; whereas camp in Mankato offered spots to hang out near a fence in hopes of scoring an autograph or see players riding by on their bicycles, occasions for spontaneous interaction with players were fewer and further between in Eagan. The Vikings designated one day in camp for each position group to sign autographs — as they did in Mankato — and lines for more popular players formed several hours before the autograph sessions started (which, again, likely wasn’t much different than Mankato). The team also brought a number of children onto the field each day for autographs through its kids’ club, and had afternoon autograph sessions with special needs kids through its community outreach programs. Fans could also win autographed items through the “Chuck for Charity” game the team had in TCO Stadium. But without the Vikings’ official channels, there seemed to be fewer chances to catch a player’s attention, short of lining up near a rope off the corner of the practice fields and hoping players would go out of their way to sign autographs on the way back to the weight room or locker room. It’s worth pointing out here that the Vikings’ facility is going to change dramatically in the next decade or so. The team has talked about building a hotel as part of its future development plans for the 200-acre site. Assuming players eventually stay at that hotel, opportunities to catch them riding bicycles to their rooms between practices could return. In the meantime, things are bound to have a different feel than they did in Mankato. Anderson said it’s too early to say what the Vikings might change about the autograph process for future camps, but said the team will certainly discuss it before the 2019 camp. The Vikings, Anderson said, drew about 63,000 fans for their first year of training camp in Eagan — which was similar to the team’s approximate attendance figures in recent years in Mankato. The team has said it drew roughly 68,000 fans during the final year in Mankato, and routinely drew between 50,000 and 65,000 fans to Minnesota State University, depending on the length of camp. The Vikings had an extra week of open practices in Eagan, and fans claimed roughly 90,000 tickets for this year’s practices. With roughly 72,000 of those seats available for free, though, fans could reserve them ahead of time and decide not to attend practice; Anderson said the Vikings often saw fans reserve four tickets for a daily practice session, and only use one or two of them. The Vikings released additional tickets during training camp, once they had a better handle on security processes and daily attendance rates, and the way they handle ticketing could change for 2019; Anderson said the team will look at the no-show rate and adjust for future years to make sure more fans can attend and more seats are full. The Vikings’ 52-year run in Mankato meant several generations of fans had formed traditions there, and there’s no precise way for those to be replaced in a facility that’s markedly different from where the team had trained since 1966. But given the amenities for players and coaches in Eagan — not to mention the Vikings’ opportunities for future development — it’s safe to say training camp isn’t going anywhere. And whether it was through proximity to home or the team’s gleaming new facilities, many of you said you were either happy with camp in Eagan, or at least willing to give it a chance.